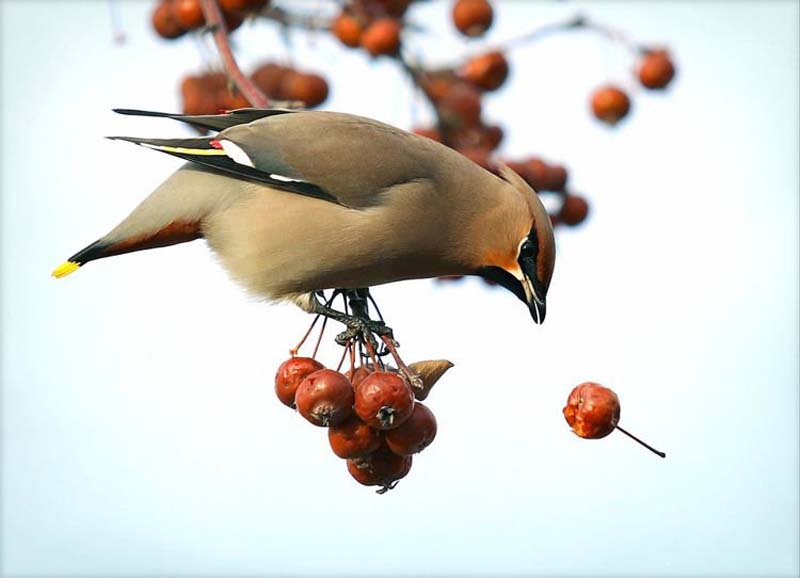 The people of Gilbert, Minnesota, have been reporting erratic bird behavior which is allegedly caused by eating fermented berries. Police in Gilbert City, Minnesota have been getting reports of birds acting erratically – flying into windows or moving traffic and acting confused. They recently issued a statement explaining that the birds are “flying under the influence” after feasting on fermented berries. An early frost has caused several types of berries growing in the area around Gilbert to ferment earlier than usual, but that didn’t stop the local bird population from feasting on them. The problem is that, like human teenagers, young birds can’t handle their alcohol as well as mature ones, and the ethanol entering their system causes them to act strange. And as they are getting ready to fly south for the winter, many bird species tend to stuff themselves with whatever food they find in order to build fat for the long journey, causing them to get really drunk. “The Gilbert Police Department has received several reports of birds that appear to be ‘under the influence’ flying into windows, cars and acting confused. It appears that some birds are getting a little more ‘tipsy’ than normal,” Gilbert Police Chief Ty Techar wrote in an official statement, last Tuesday, adding that there is no need for people to call the police about such birds, as they “should sober up in a short period of time”. 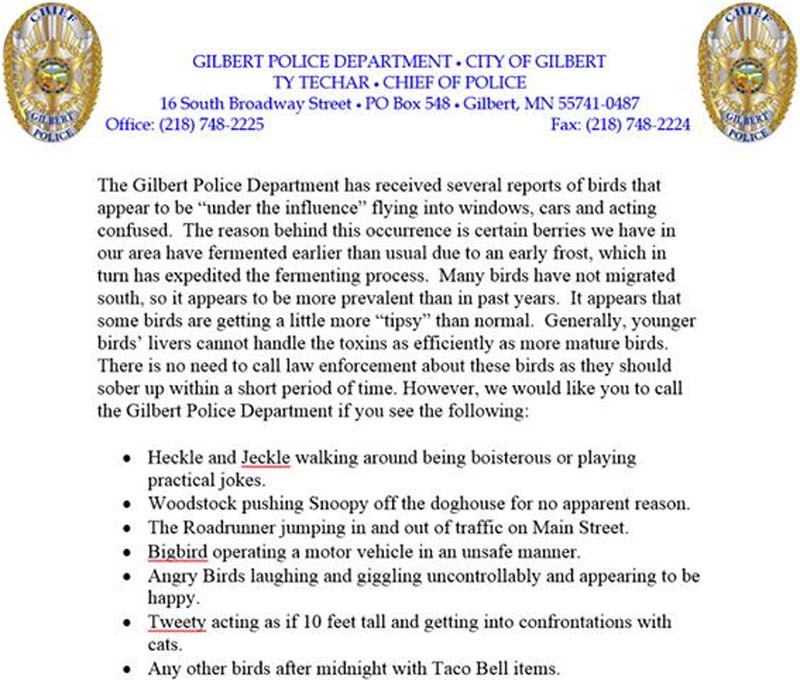 And while the police statement published on Facebook goes on to joke about instances where locals should contact police, like “Angry Birds laughing and giggling uncontrollably” or “The Roadrunner jumping in an out of traffic on Main Street”, the people of Gilbert were grateful for the explanation, as many of them had spotted drunk birds but had no idea what was going on. “This explains why I have hit 7 birds with my car this week,” another person commented, and one woman described having to slam on her brakes when a bird flew directly into her windshield. In places like Portland, Oregon, or in Canada’s Yukon Territory bird conservation organizations operate rehabilitation centers for drunk birds, holding them in captivity until they sober up. While the idea of birds flying under the influence may seem funny at first, getting intoxicated on fermented berries can be fatal for many of them, as they tend to act careless, flying much lower than usual and colliding with hard surfaces at high speeds.